discrimination task force meeting last Monday. “You can call yourself a sanctuary city but it doesn’t change that we have no authority to stop immigration from coming into our city and doing their lawful and authorized duties,” said Koller. ALSO: Few Hayward elected officials support starting discussion on sanctuary cities. A number of Hayward residents, though, resisted the city’s presentation, saying the sanctuary city designation is a strong political message that needs to be sent to the Trump administration and a declaration of Hayward’s values in support of immigrants and religious groups. Trump’s boiling rhetoric toward minorities may be even more pronounced in Hayward. According to the most recent U.S. Census in 2010, Latinos make up 40.7 percent of Hayward’s 140,000 residents, making it not only the largest demographic in the city, but the entire East Bay. Monday’s night presentation was featured during the second meeting of the 22-person task force convened by the city in January to update its nearly 30-year-old anti-discrimination policy. The issue of Hayward becoming a sanctuary city was mentioned often during the initial meeting by its members and the public, necessitating a presentation this week. Roughly two-thirds of Hayward’s possible exposure to the threat of losing federal funding by becoming a sanctuary city includes $20 million in future funding for its executive airport, a fact that makes it unique among East Bay cities, said McAdoo. Hayward also relies on a portion of federal money for its water treatment plant, she added. “It’s a pretty significant number,” she said, referring to the total amount of federal funds potentially on the line, coupled with Hayward’s take of property and sales taxes that are lower than some other wealthy East Bay cities. McAdoo said the city’s federal lobbyist has been in daily contact with Hayward officials. “What we understood is that the federal government is on the lookout for news or cities that have made a public statement about being a sanctuary city,” said McAdoo. However, the constitutionality of Trump’s executive order issued Jan. 25 that threatened sanctuary cities with the loss of federal dollars has been questioned by many. City attorneys is every East Bay city that has embraced the sanctuary city movement has offered legal opinions that downplay Trump’s threat. Austin Bruckner, a member of the South Alameda County Young Democratic Club and Hayward resident, called the city manager’s presentation dishonest for omitting information such as the uncertainty of whether Hayward will actually receive any of the $33 million in federal grants for which it has applied, in addition, to failing to offer context for the funding within Hayward’s entire fiscal budget. Halliday and the majority of the council are believed to be opposed to bringing the sanctuary city issue up for council discussion. Four votes out of seven councilmembers are required to place an item on the agenda. As mayor, Halliday has the power to do so unilaterally. 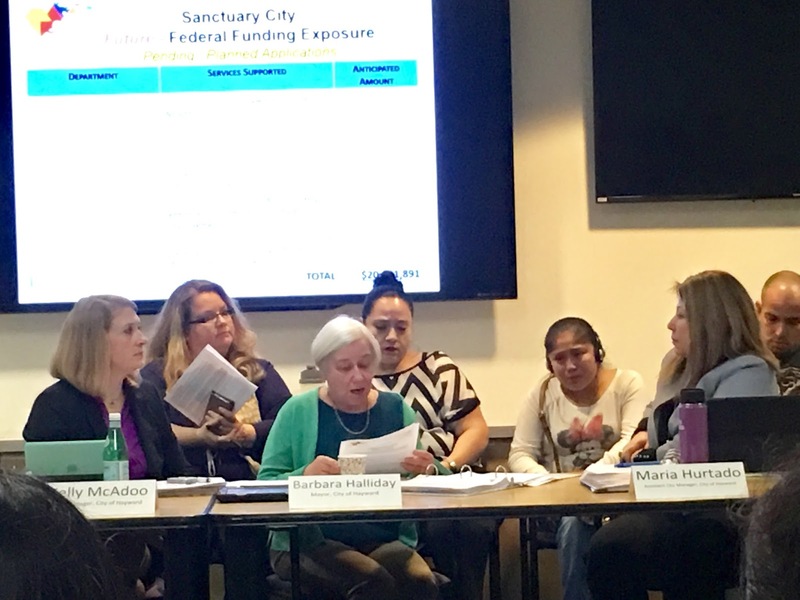 Sanctuary city discussions in other East Bay cities have been almost been perfunctory while eventually receiving near unanimous support among elected officials. Even in Dublin where clear hostility toward the issue exists, the City Council, at the behest of five members of the public, placed the sanctuary city item on its agenda for discussion at a meeting last week. The Dublin City Council unanimously voted against moving the information-only item forward. Posted in Barbara Halliday, federal funding, Hayward, Hayward Police, ICE, immigration, Kelly McAdoo, Mark Koller, President Trump, sanctuary city. Bookmark the permalink. What is “wrong” with Hayward's public officials? Don't they realize that the current politically correct nonsense with the members of the FAD OF THE MONTH CLUB, but who pretend to be “liberals,” is being in favor, or at least pretending to be in favor, of sanctuary ordinances!!!! NOTE: The way it almost always works with the great independent thinkers and sub mental retards who pretend to be liberals is that after the first one comes out strongly in favor of some garbage and nonsense, is that soon all the rest of them also follow in line, and just as recently all sub mental retards who pretended to be liberals were required to believe in, or at least pretend to believe in, the “wisdom” of transgender bathroom access, all phonies who pretend to be liberals are now required to strongly believe in, or at least pretend to strongly believe in, the “wisdom” of having sanctuary ordinances. In fact, I think Hayward's public officials should be hung, drawn, and quartered for having committed the very worst and most heinous crime of all, in other words of being politically incorrect. California should also set up a commission to check the qualifications of all public officials, and no one should be allowed to hold public office who is not politically correct. Halliday is a lame duck. Sweeney must be against it, that's why the others don't want this item on the agenda. HUSD should bring it up at every council meeting until council places on the agenda. Time to listen to the people of Hayward and tune out Mike. The budget is only an excuse to not be there for the community. Please tell us when Hayward Officials resist raising taxes.